When a new toy line becomes successful, there are usually a bunch of cheaper copies created to look like the originals, and to sell like originals. This was no exception for the Jem dolls. Jem was Hasbro's flagship, and there were all kinds of knock-offs and cheap imitations. Some are obvious bootlegs and are mostly done by smaller companies, while the bigger ones try to hide their attempts by making their own and a little different version of the original idea without stepping on any copyrights and trademarks. Then of course there are those dolls that just happen to be lookalikes, and sometimes it's hard to tell which ones are what. Too much competition is believed to be one of the reasons that eventually caused the Jem doll line to be discontinued, since it prevented the sales of the Jem dolls. But Jem obviously made it's mark and a lasting impression in the history of doll lines, and even today you can find new dolls that are clearly inspired by Jem dolls. Here are some dolls that have something in common with the Jem dolls in one way or another, either they are direct bootlegs, rockstars, have punk hair colors, were made by the same company, were made in the 80's, or have some characteristics that reminds of Jem. The queen of all fashion dolls ever since she first arrived in 1959, invented by businesswoman Ruth Handler, based directly on the German doll Bild Lilli. Barbie is a modern woman who has all kinds of interests and professions, she has a boyfriend named Ken and lots of friends. Although there's been a number of attempts to put her off the throne by other toy companies, several of which have practically succeeded, she has always worked her way back by creating new competition and following trends. Having a worked in name and being backed by such a huge company, has of course been an advantage. In 1985, Mattel learned that Hasbro was releasing the Jem dolls. 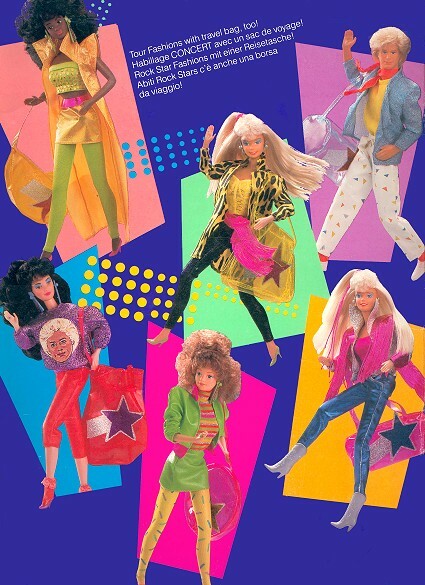 Barbie was Mattel's biggest brand, and Mattel apparently felt that the Jem dolls, even with the differences in size and theme, and even before they were released, posed a big threat. This was going to be the biggest competition that Mattel had faced for their worldknown doll line Barbie. 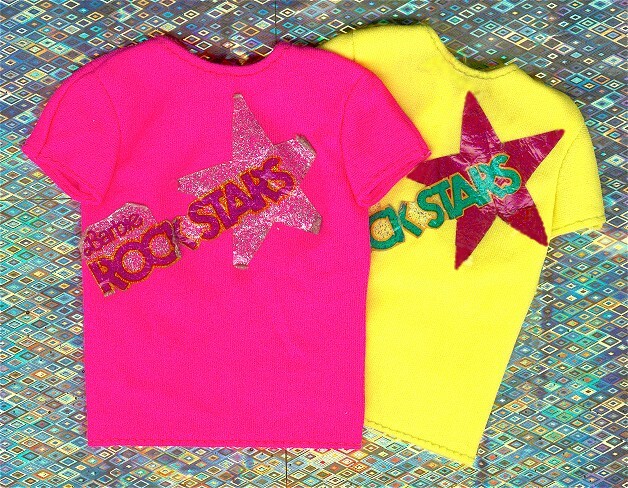 Mattel was terrified of the competition and decided to give Barbie a rockband too, "Barbie and the Rockers", or "Barbie and the Rockstars" as in Europe. This was a completely new direction of the Barbie doll which had been pretty harmless in her previous releases, usually as a princess or a ballerina or such. 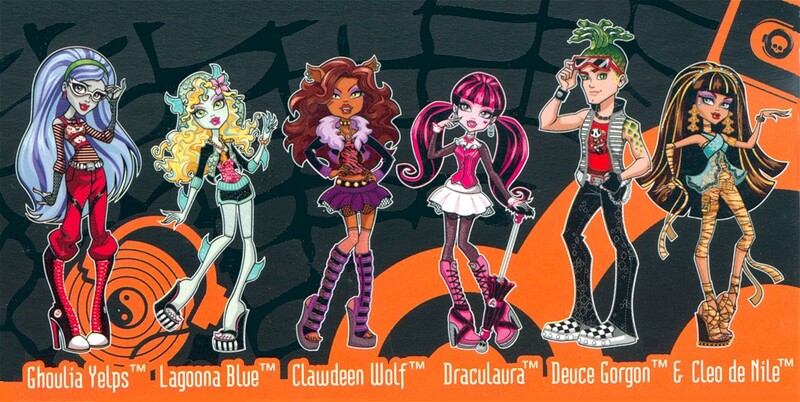 The first set of Barbie and the Rockers dolls to arrive were Barbie, Diva, Dana, Dee Dee and Derek. The dolls came with a fashion, shoes, a microphone, a sheet of cardboard prints, an iron-on decal, and the females also had a hairpiece, ring, bracelet, extra t-shirt and a hairbrush. 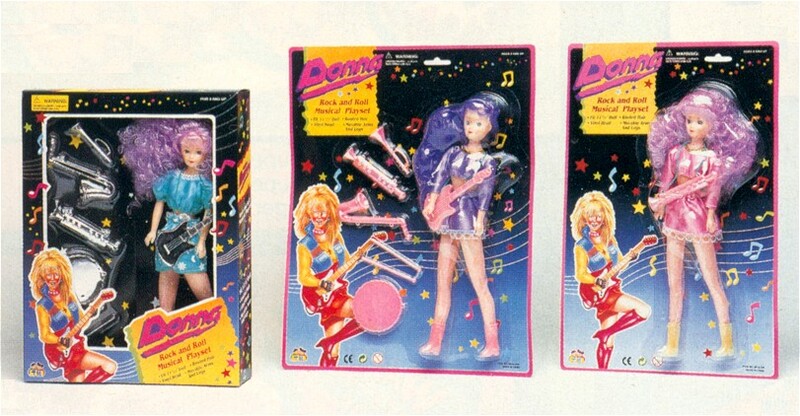 Barbie came with a cassette which included the songs "The Rockers Theme", "Dressin' Up", "Born With A Mike", and "Stretchin' It", only two of which were included in the cartoon. The second edition of the doll band was called "Real Dancing Action" for the females, and "Hot Rockin' Fun" for the males. Now there was one more male added to the group: Ken of course. This edition of dolls would kinda move their arms when you turned their body, they had new fashions but included no cassette. The third set of dolls included Barbie and three female friends and a male, as "Barbie and the Sensations" and had a 50's look to them. They resembled what Barbie and the Rockers looked like when they travelled back in time in the cartoon. But all characters except Barbie changed to a name starting with a "B": Diva to Bopsy, Dee Dee to Belinda, Dana to Becky, and Ken to Bobby. There was also a line with six female fashions. There were two sets of fashions released: Barbie and the Rockers fashions included 12 different fashions, two of which were for the male dolls. The second set of fashions included 6 fashions, one of which was for the male dolls, and was called "Concert Tour Fashions" or "Tour Fashions" in Europe. There was a playset of a stage called "Hot Rockin' Stage", a pool called "Rockin' Pool Party", furnitures set called Rockin' House Party, extra instruments set called "Live Concert Instruments" and "Rock Concert", and other playsets like "Vanity Set", "Dance Cafe", "Recording Studio", "Hot Rockin' Van" and a remote controlled "Rockin' Cycle". And a cassette player without a stage in the same like Jem, called simply "Barbie And The Rockers Cassette Player". 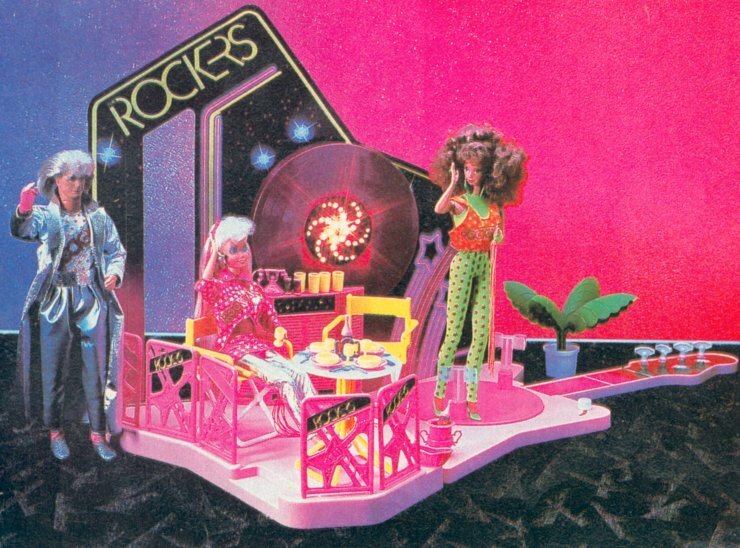 As mentioned, there was even a Barbie and the Rockers cartoon made, in two parts, called "Out of this World" and "Rockin' Back to Earth", which featured all the characters, and several of the outfits and playsets. In the cartoon, Barbie and the Rockers were the only band around and loved by everyone in the whole world. There was certainly no competition from a band like the Misfits. Alot of the cartoon was about being friends and having a good time. At their worst, the Barbie and the Rockers characters were tired or disappointed for a second, then it was time to sing and dance again. They even went into space to perform. 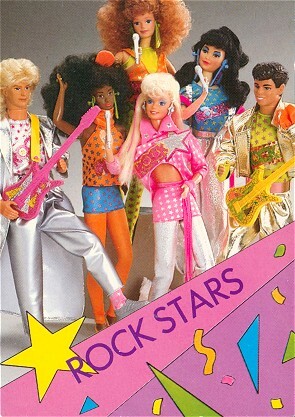 Similarities to Jem, other than colorful rockstar dolls, were that the Barbie and the Rockers dolls had an edition of the leadsinger with star earrings, there was a male doll with combable hair, the group had one black and one asian member, the dolls came with a cassette with songs, and there was a Stage playset and a car. While the Jem dolls had more realistic and more bendable bodies, Barbie and the Rockers had their "Real Dancing Action" edition of dolls. Both of the cartoons had music videos that were blended with the action. 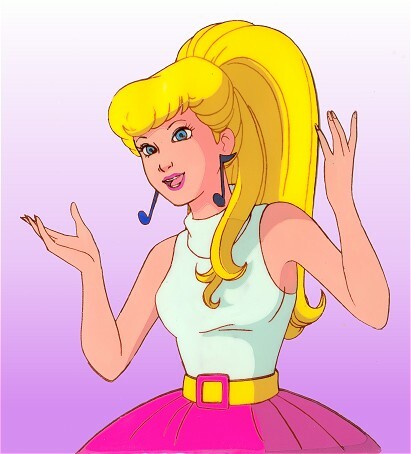 The cartoon included some similar storylines as in the Jem cartoon, like time traveling and a fifties theme. With all the similarities, Barbie and the Rockers were still apparantly of lower quality, as could be expected since they were made in a hurry and rushed out to compete with the Jem dolls. Half of the about 10 songs sang by Barbie and the Rockers in the cartoon were covers of old songs, some by the Beatles. While the Jem cartoon contained over a hundred songs, with no covers. Mattel didn't seem to care at all about Barbie and the Rockers once they managed to silence Jem. Today however there is no question about which of these 80's rockstar cartoons and dolls is more remembered and popular. Try to search for a better site about Barbie and the Rockers than this one for example. And take a look at the auction site eBay, Barbie and the Rockers dolls are barely selling. While Jem dolls are selling better than ever. This is probably also how the sales would look today if Jem made a comeback into the toystores, even if Barbie and the Rockers made a copy-comeback (infact Mattel re-released an anniversary issue of Barbie from Barbie and the Rockers in 2008). Especially since the only thing that speaks in Barbie's advantage is that it's a wellknown brand and that Barbie has set the standard of doll fashion sizes, which won't fit dolls in bigger sizes like the Jem dolls. But those are easy fixes for Hasbro. Offsite link: More info about Barbie and the Rockers on this page. 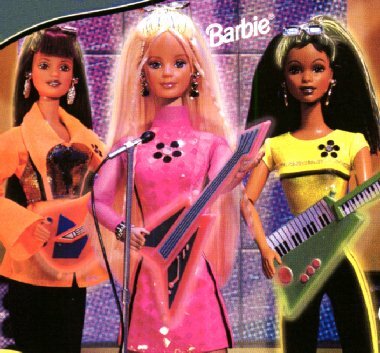 To make sure Jem was really dead, Mattel put out another band for Barbie, consisting of Barbie, Midge and Christie. This time they had glow in the dark fashions, and again came with a cassette tape, with songs written by Jerry and Cheryl Caglese and co-produced by Carlos Rios. There was also a fashion line with glow in the dark fashions. After Barbie and the Beat, Mattel kept releasing music themed doll sets for Barbie, as if they had some kind of tics: Lights & Lace: "The hottest video music star", Rappin' Rockin': "Dance with Barbie to a jammin' beat". Off-site link: Barbie & the Beat cassette music. 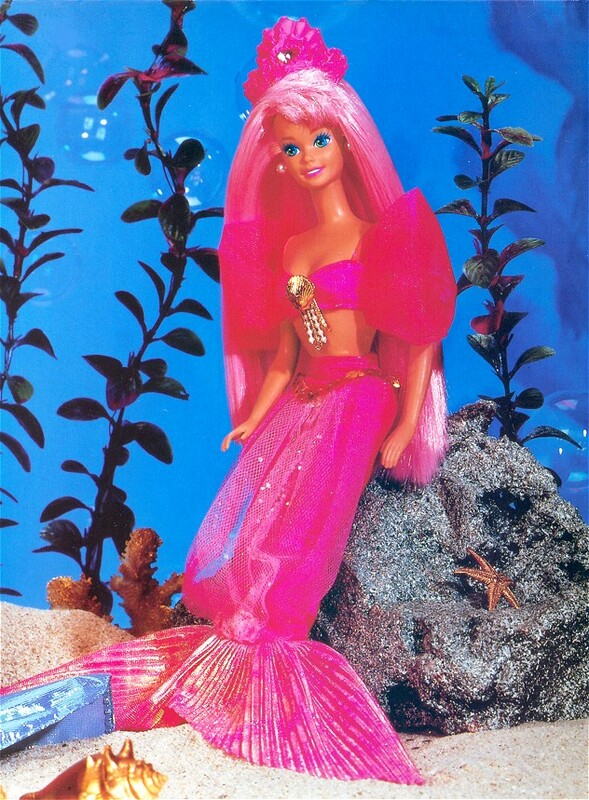 When the rights to Disney's "Little Mermaid" went to Tyco, Mattel did the same thing as always, their own version, but with pink hair? This might have been the very first time Barbie actually appeared in completely pink hair. It only goes to confirm how much Mattel really feared Jem back in the 80's and wish they had made her. And about 8 years later it was time to release another pink-haird mermaid called "Mermaid Fantasy". Here is a Barbie with pink or blue hair streaks. Came with some kind of color to wash Barbie's hair with so it would go pink or blue. In the late 90's as a response to the Spice Girls which had their big breakthrough a year earlier, and with Jem and the Holograms in memory, Mattel did it again, they responded with a rockband for Barbie, named "Beyond Pink". Beyond Pink consisted of Barbie and her friends Teresa and Christie. Barbie got a dress that reminded more of Jem's than ever, the dolls now had wild hair color strands, glow-in-the-dark accents in their hair, Jem style instruments, and came with a cassette again, this time with a song called "Think Pink", Dance Moves Barbie: "You make her move like a real dancer". If you dip this Barbie's styling tools in cold water, you can stamp or stencil pink and purple hair tattoos. As usual there's a Teresa and Christie version also with punk hair colors. Barbie got pink hair once more. There's also Barbie and Christie, both with the haircolors pink, orange and yellow. But Teresa was the most interesting of them. Teresa has light brown hair, plus the "hula hair" with the three punk colors, red, blue and purple. The same three colors as the Holograms dolls, Kimber (red), Aja (blue), Shana (purple). It was a new century, and Mattel still hadn't gotten over Jem. This was perhaps one of their closest attempts to make dolls that looked like Jem. To begin with, the name "Jam", and to use it the same way the Jem line did "Jam'n Glam" (like "Glitter 'n Gold Jem" or "Rock 'n Curl Jem"...). Then there's the haircolors, you could switch between normal hair colors into wild hair colors. There were playsets like instruments and a tourbus that turned into a stage. After Jam'n Glam, Mattel released even further sets with a music theme similar to Jem: Pop Sensation, My Scene: Jammin' In Jamaica, Chat Divas, Fashion Fever, I can be a Rock Star. 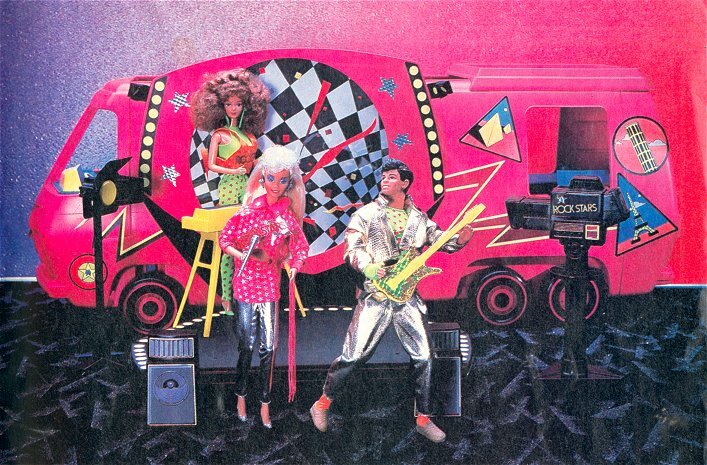 Off-site link: Jam 'N Glam Barbie Commercial. Mattel covered all kinds of themes, whether it was female action figures, princesses, aliens, or now recently... monsters. She-Ra the heroine of the planet Etheria, is the alter ego of Princess Adora, who is He-Man's lost twin sister. She-Ra is the leader of the Great Rebellion who are fighting against the evil Hordak to protect the planet. There was a 93 episodes long cartoon created by Filmation. This line of action figures with rooted hair, arrived at almost the same time as Jem and although it had figures with punk hair colors, and She-ra had a dual identity, it wasn't a direct competition for Jem. She-Ra was Mattel's way of making a female version of He-Man and the Masters of the Universe, as well as cashing in on the Golden Girl line by Galoob. The line wasn't a big success outside the US. Lady Lovely Locks is a princess, who togheter with her friends Maiden FairHair, Maiden CurlyCrown and the flying animals called Pixietails, defends the kingdom of Lovelylocks against Duchess Ravenwaves. There was a 20 episodes long cartoon series by Dic. 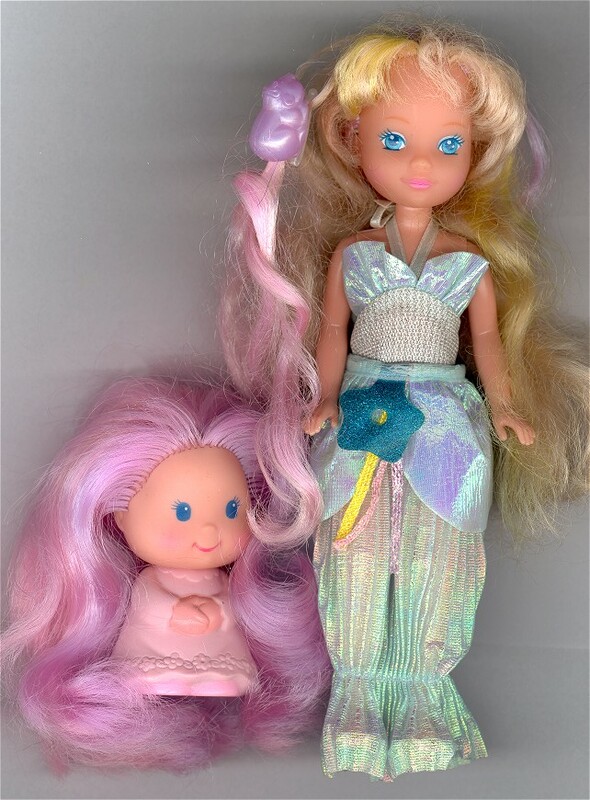 This was another line of 80's dolls with colorful hair, although not much direct competiton for Jem. These alien dolls from the planet "Shimmeron" had chrome bodies, sparkling strands in their hair. 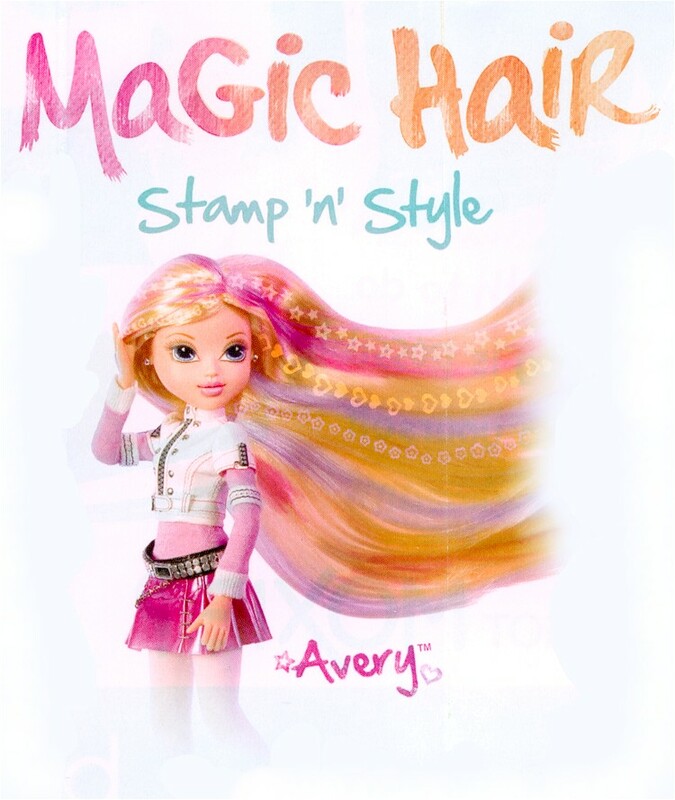 A line that was created by Mattel, and while Barbie and the Rockers covered the rockstar part about Jem, this line covered the wild hair colors and Jem-like makeup. Although the chromed bodies somewhat resembles Synergy's purple body, the reason they had chromed bodies was probably to compete with another doll, by Tonka, called Aurora. The main character of course had bright pink hair, and of course the male character had combable purple hair, and the black female member of course had bright purple hair. There was also a line of fashions available and playsets. This line wasn't a big success across the world. When Hasbro didn't give up, but changed everything about Jem they thought would sell better, by making Maxie, Mattel must have been shocked. Mattel had released all they could think of to compete with Jem, a rockgroup, The Rockers, and dolls with punk hair colors, Spectra. Now it was time for Mattel to compete with Hasbro's more down to earth, blonde, high school doll line Maxie. So Mattel introduced Jazzie, as the "Cool Teen Cousin of Barbie". Mattel played it safe, they added a visible "Barbie" logo. They also got this line out quite fast, like they did with the Rockers. This was possible by re-using molds and some ideas from their own ealier lines, which could match the theme of Maxie. Jazzie boxes said "high school", which made it obvious they covered the same theme as Maxie. And Jazzie had a more round and youthful face and body than Barbie, and more colorful clothing. Jazzie and her friend Chelsie (redhead) got their head molds from Mattel's line Starr from 1979. Her friend Stacie (african american), got her headmold from the 1972 Mattel doll Steffie. And Jazzie's boyfriend Dude got his facemold from Derek of the Rockers. 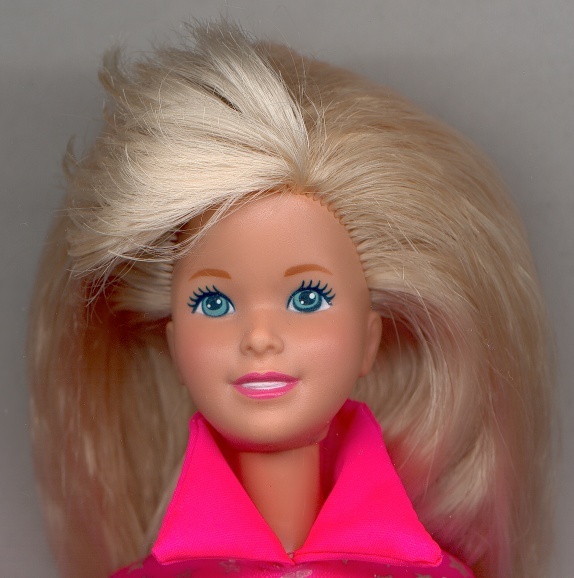 Perhaps Mattel was also inspired by it's own 1966 teen cousin of Barbie, called Francie. It looks like Mattel were still competing against the Jem line aswell, by choosing a music-sounding name starting with a "J", and a box with a logo that was a little more hip like the Jem boxes. And choosing more obviously smiling facemolds, which had been one of the noticable updates of the Jem dolls in their second year. This line, all in all, consisted of 13 dolls (counting the later two releases of Jazzie outside the actual line), 10 of which was Jazzie herself. There were 2 fashion lines of 6 fashions each, all for Jazzie herself. And they even took help from a known brand, Burger King, of which they released as a playset where also Barbie was featured on the box hanging out with Jazzie and her friends. They also made use of the brand Volkswagen when releasing a Cabriolet car. The dolls weren't very well received, and Jazzie was not highly marketed world wide. Mattel was actually competing with themselves by releasing a very similar line for Barbie at the same time called Cool Times. By 1990 the boxes of Jazzie became pink, perhaps to appeal to Barbie buyers. After the line was discontinued, Jazzie was kept as a friend of Barbie, they changed the boxes to look exactly like Barbie's pink boxes and with a huge Barbie logo, with the name Jazzie in smaller text. The last doll of Jazzie was released in 1992. But apparently this doll, along with Barbie's own regular line, offered enough competition for Hasbro's Maxie line to be cancelled, just before Hasbro was planning on going back to the rockstar theme from Jem, with their next release of Maxie dolls. None of the Jazzie dolls are considered rare today, and you can easily find any of the dolls up for auction. Fashionable monster creatures who are said to be relatives of the famous old monsters like Dracula, Medusa, Frankenstein's monster, Zombies, Werewolves and so on. This is definitely Mattel's most successful attempt at competing against the Bratz and Moxie Girlz. Perhaps the highest-quality, most detailed, and most daring dolls Mattel has ever put out. There are all kinds of dolls that resemble the styles and haircolors from Jem, like the redhead Operetta who is even dressed similarly to Kimber, and there's actually a car that uses the name "Roadster" like in the Jem line, not a common name for doll cars. It's not impossible this line was very inspired by Jem infact, because the twin brother designers of the Monster High line, Garrett and Darren Sander, are fans of Jem, which can even be seen in an official Mattel Youtube video where Darren wears a necklace with the Jem logo. Hasbro has put out a number of fashion dolls, most noticably Sindy, which has been their longest lasting attempt, although the doll was more popular in Europe than in the US. Then there's been several short-lived doll lines, often based on real life singers, or even disney characters. After the Jem doll line was discontinued, Hasbro continued to use accessories from the Jem dolls, like bracelets and necklaces, on their other and new doll lines. And who knows what else was originally intended for the Jem line but used on later lines instead. These dolls are the closest that other dolls can truly come to the Jem dolls, since they're made by the same company. An older version of Sindy, this Sindy with the bigger head is how Sindy looked before Hasbro bought the rights to Sindy from Pedigree in 1986. Sindy first came around only three years after Barbie, in 1962, and was a British creation in shape of a 12" fashion doll first produced in Kent. This particular doll is supposed to be a space doll, with the pink hair, silver top, a silver/pink cummerband, pink skirt and sandals. Most Sindy dolls had regular haircolors though. 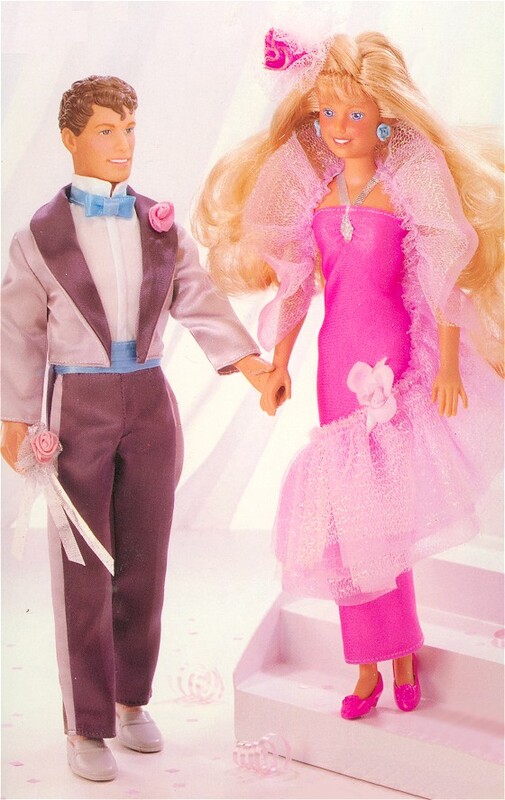 As for Jem connection, were also a couple of Sindy dolls called "Starlight", and several Sindy fashions used the same fabrics and shape of zigzag bracelets, and shared fashions with a line called Lace by Creata which made dolls based on the Jem style. Now Hasbro had taken over the line and changed the head mold, made it a little smaller, but not as small as it was going to be. This doll, although it was made by the same company as Jem, seems to have been inspired by Jem, and top fabric is the same as the 1987 Jem Music Is Magic fashion "24 Carat Sound" the earring mold and color are the same as the 1987 Raya doll came with. Also included a similar microphone. This particular look was later re-released with Sindy's new smaller head, which had a change of top fabric though. This is an example of the next version of Sindy's changed head size, which was more in size of Barbie's head. 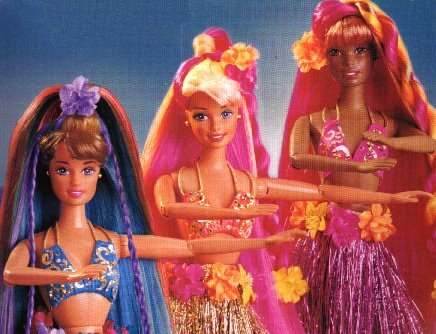 These dolls provided Barbie with a lot of competition in Europe, until atleast around 1996. This particular doll is interesting because it came with three bracelets, a pink, a yellow, and a black which have the exact same shape as the bracelets that came with the Jem dolls Glitter 'n Gold, Rock 'n Curl and Clash. It seemed that Hasbro thought a rockstar doll like Jem was too distant for girls to identify with. And instead of changing Jem, Hasbro threw Jem away and started over. Still, Maxie inherited several things from the Jem dolls, as Hasbro re-used some sculpts for the male doll bodies, accessories like earrings, sunglasses and bracelets, and used some ideas that were supposed to be used on the Jem dolls before the line was discontinued. Like jewelry molds, or very similar ones, that was originally to be used on the Rockin' Romance Jem doll. The dolls were more similar to Barbie's thinner size. Maxie was of course the main character with blonde hair, then there were her friends the brunette Ashley, redhead Carly, african american Kristen/Simone, and Maxie's boyfriend Rob. There were plenty of playsets aswell. The line only lasted three years though, atleast 28 dolls were released, and before it ended Maxie was even planned to get her own rockband, much like Jem. Maxie also had her own cartoon called Maxie's World by DIC Entertainment, which lasted 32 episodes, almost half as long as the Jem cartoon, in which Maxie was a blonde high school girl with her own tv show, and otherwise lived a very down to earth life in seaside town of Surfside. The animation quality wasn't very great, but like Jem, it included some songs, but included more as background music. Off-site link: The Sunny Surfin' World of Maxie. The colorful ponies with combable hair and tail, that each had a special marking on both sides of their flanks. These ponies first appeared in the early 80's and were based on a less colorful pony called My Pretty Pony, also by Hasbro. There are regular ponies, seaponies, pegasus, unicorns, flutterponies, mermaidponies, and other animals even. Infact there are hundreds or even thousands of different ponies made since the 80's. And the line keeps returning in new shapes. Their first comeback was in 1997, the second was in 2003, and they're still around, currently in the fourth generation, referred to by collectors as G4. There were lots of fashions and playsets aswell. There were cartoon episodes and a movie made in the 80's, and in later years new shows have appeared aswell. Collecting these ponies might seem like an impossible mission, especially since so many different ponies where created in different countries. The original series of ponies in the 80's and early 90's, released in the US and Europe, are called G1 and considered to be the main line, because these were released in higher numbers and were more consistant in their appearance. While ponies made in other countries during that time are referred to as Nirvana ponies. Infact there are some big differences even between the US and Europe ponies. Certain sets of the US ones were flocked, called So Soft, while the European ones were regular plain. Europe didn't get all ponies of some sets, but on the other hand they had some sets that were not available at all in the US. You won't have any trouble finding most of the US and European ponies for sale today though, since they were very heavily massproduced. It just comes down to the rare ones which are more difficult to find, like the mail-in ponies, Euro exclusives (if you live in the US), Nirvanas, or even rare 80's bootlegs. And you have to be up to locating them all and perhaps buying lots. If you're planning to sell yours, let me tell you good luck! Because most collectors are so spoiled with finding options of ponies for sale, that they won't look your way unless you're a wellknown name in the pony collector communities who knows how to clean and restyle a pony. Or unless you are willing to sell a perfect shape pony for practically a dollar or two. But like many old toys, the ponies suffer from their own defect, unsensitively called "pony cancer". Which, along with penmarkings, haircuts, and worn hair is probably the biggest problem collectors have to face. 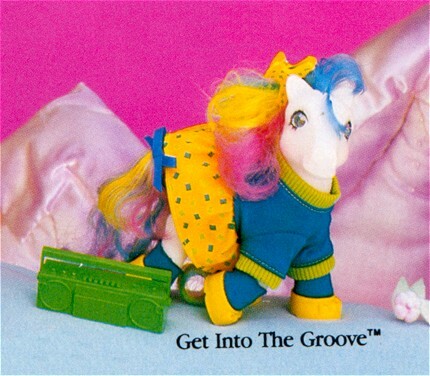 Since these ponies were made by Hasbro they shared molds with Jem for certain items, like the "Get Into The Groove" fashion in 1987 which included a green boom box in the same shape as the Jem doll Danse has in orange. Something that was believed to connect the My Little Pony line to the Jem universe was the mail-in offer Rama Llama. A mysterious pink lama that was later proven to only be intended for Jem, even though it perhaps bares more resemblance to the colorful ponies. Off-site link: Dream Valley - A Collectors Guide to My Little Pony. Sort of a mix between My Little Pony and Jem. The connection to My Little Pony is obvious, and to us Jem fans so is the connection to Jem. 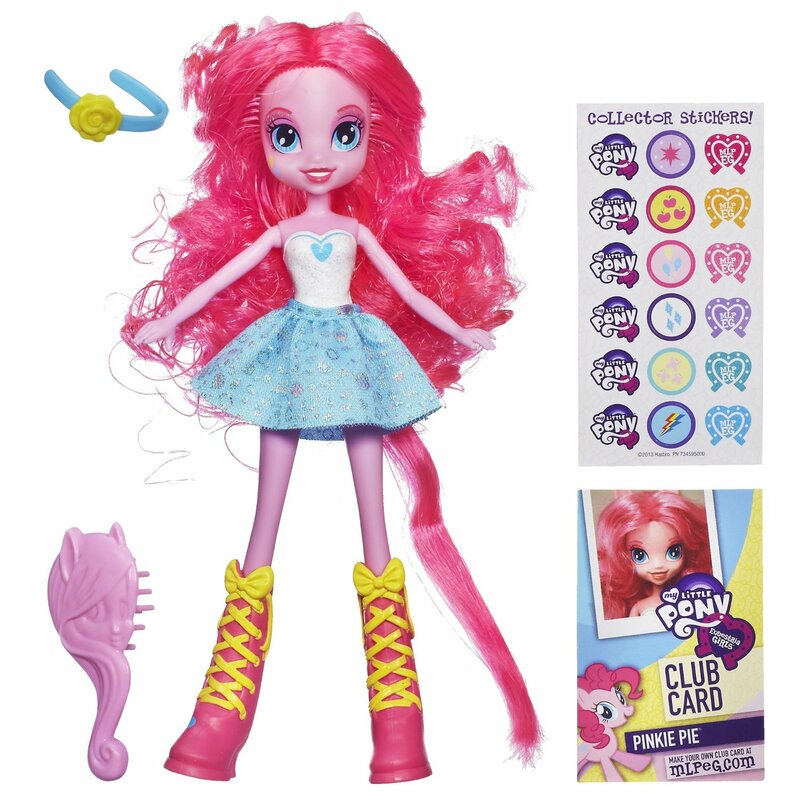 The dolls come with colorful hair like Jem, but with pony ears. Some editions even come with instruments, and they have their own band called The Rainbooms. Made by Kenner, a company that was bought by Tonka in 1987, and then Kenner and Tonka were bought by Hasbro in 1991. The body shape is similar to Jem. There were no punk hair colors, and the fashions were more elegant and 70's like than rockstar-like. There was also a fashion line, and a disco playset. Golden Girl and the Guardians of the Gemstone is a line of female actionfigures (as well as two males) who battle against the evil forces of Dragon Queen. Female action figures are not the most common toys, and these pre-dated Mattel's She-ra, and were of superior quality. They were very detailed, had combable hair in punk hair colors, came with a cape, shield (in metal! ), weapons and a comb. There was a line of fashions and playsets which included a couple of horses and a castle. There's no connection to Jem, but this was a cool line worth mentioning. Off-site link: The Lair on Storm Isle. About Rose Petal and her friends Lily Fair, Daffodil, Orchid, Sunny Sunflower, and Iris, which was available as a movie. Came out before the Jem line, and other than the colorful fashions, the only connection to Jem is that they share some of the fabrics of the Jem doll line. 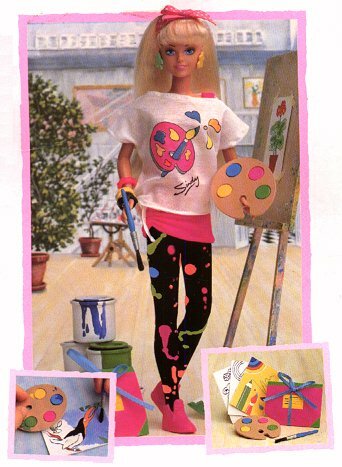 The fashion "Painting Posies" had a fabric that was going to be used on the Music Is Magic Jem fashion Splashes of Sounds, and was featured on the fashion box, although they for some reason went with another fabric for the Jem fashion. The boxes said "The ultimate poseable fashion doll!" and "The future looks beautiful". This was apparently a futuristic line of dolls. Aurora, Mirra and Lustra came with chrome bodies and wild hair colors, like pink, blue and purple. This line was an obvious copycat of Jem. Or perhaps something inbetween Jem and the Rockers. 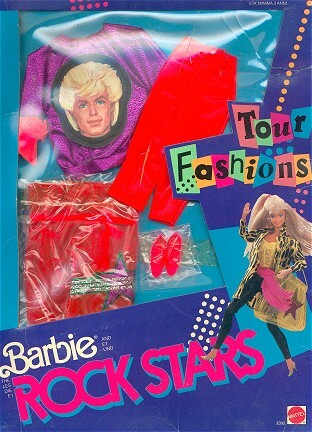 The box says "The Celebrity Rock Star with Fashion & Fame", which is partly the same as in the Jem theme song. It consisted of female dolls with regular haircolors with some streaks of either pink, red, light blue, or black. It also got a male member in the third edition, called "Glow N Glitter Ladd", does the name remind you of Glitter 'n Gold Rio? It even had a line of fashions. In box. What's most exciting about this line is that it can practically be considered a semi-official sister-line to Jem, like Sindy, Maxie and Darci. 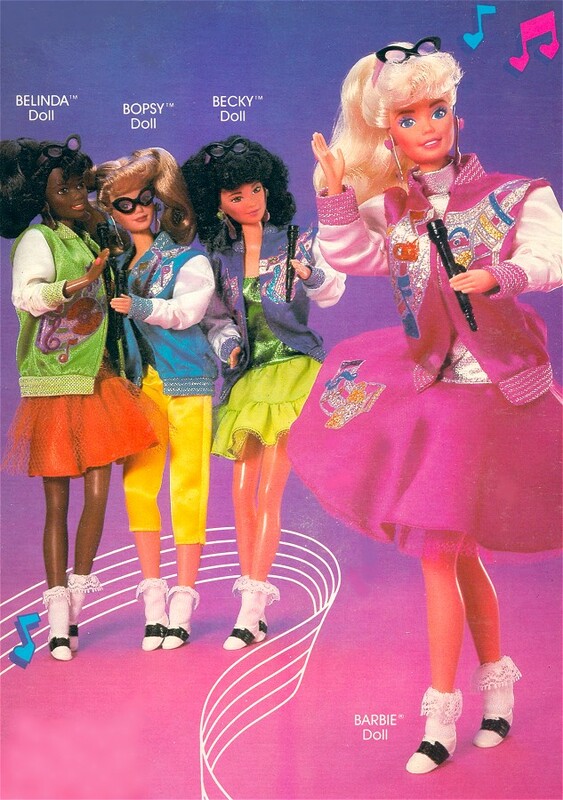 I'm not certain about how it all fits together, but apparently a Sindy set of dolls by Hasbro was released with the very same fashions as the Creata Lace dolls, the 1986 Disco Magic Sindy Dolls. Perhaps this fact will get some collectors running for unsold Lace dolls on online auctions, much like the My Little Pony collectors do for the Takara fakies. Creata also copied other doll lines of the time, like Lady Lovely Locks. Off-site link: Creata's Lace Celebrity RockStar. 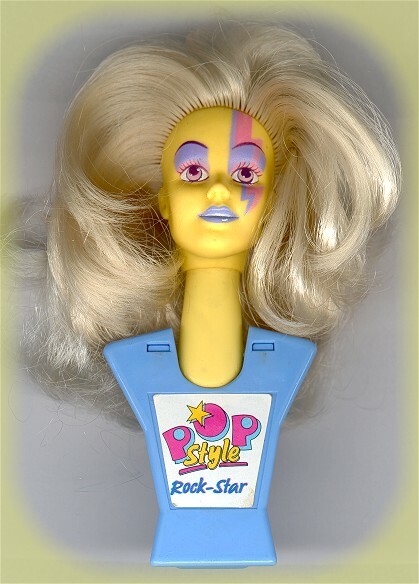 This is one of atleast four dolls, or atleast heads, called "Popstar/Popstyle styling heads". 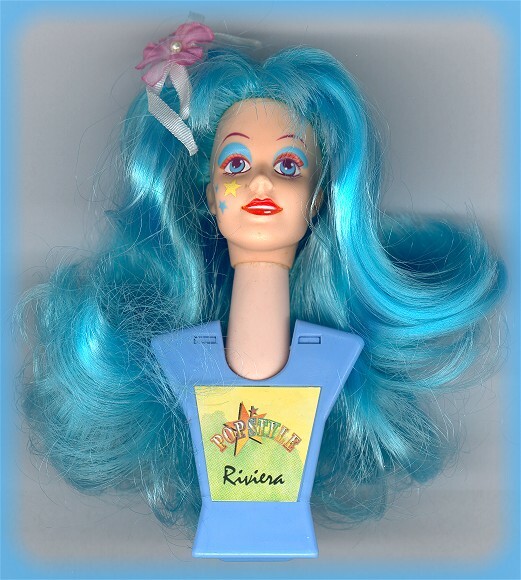 This is the most interesting of the dolls, it very much resembles Stormer. The flower in the blue curly hair, and that makeup. The other three have white hair and are called "Princess" or "Rock Star". One of the first boybands. They consisted of five members: Jordan, Jonathan, Joe, Danny, Donnie, and were formed in 1984. They became world famous in the 80's and early 90's, with hits like "Step by Step", "You Got It (The Right Stuff)" and "Hangin' Tough". There was even a cartoon about them that featured their music, in around 18 episodes. 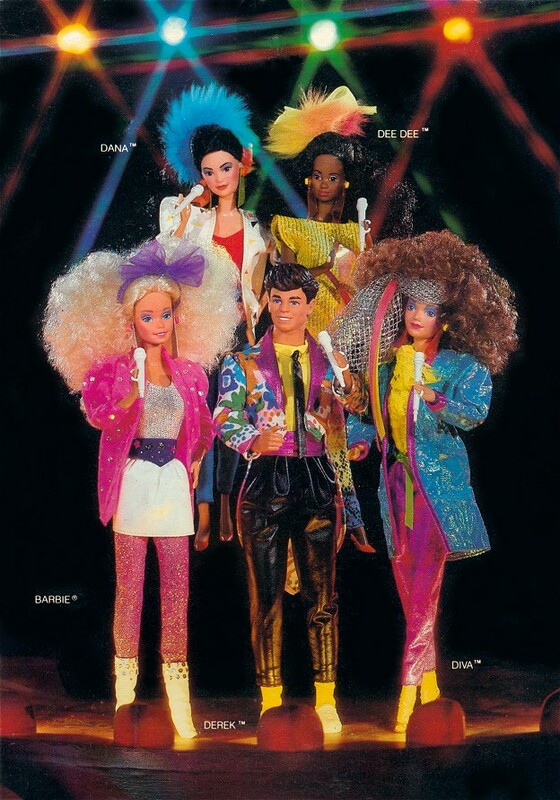 The main similarities to Jem is that they're a music group, with dolls made by Hasbro. The bodymold may be similar to Rio's. They also came with a mike (looks like the same shape as the Jem mikes), and there was a stage playset. Two issues were available "Hangin' Loose" and "In Concert" which came with a cassette. The Spice Girls was a girlgroup of five members from the United Kingdom, who formed in 1994 and had their breakthrough in 1996 with the song "Wannabe". For a few years they gained success by marketing themselves almost as specific characters with nicknames, using the key phrase "Girl Power" and cashing in on all kinds of merchandise with their name and pictures on it. A doll line was one of the things that was released, and it consisted of 11 editions and lasted for about three years. The girlgroup had several similarities to Jem and the Misfits, by the way they chose to market themselves, their looks and music videos. And the doll line only added to it all. Some of the dolls had punk haircolor strands, and their fashions had alot in common fabrics-wise. 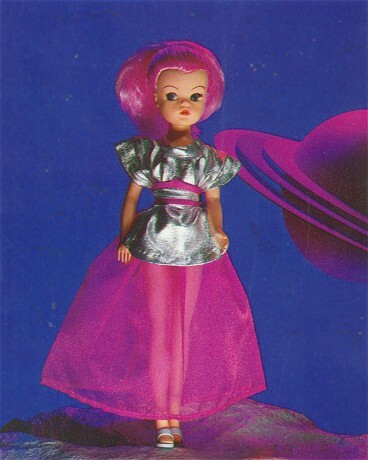 The first edition Emma doll resembled the first edition Jem doll alot, with it's metallic pink minidress. 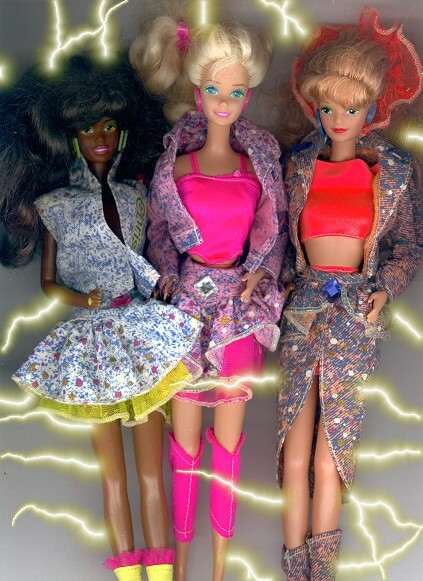 But the big deal was the Jem line's trademarked phrases which the Spice Girls dolls used without permission, like "Smashin' Fashions" and "Truly Outrageous". And there were rumors of a cartoon for a while, which never happended. Eventually Hasbro bought Galoob, and started making their own version of the Spice Girls dolls. Off-site link: Spice Girls Vs. Jem. These dolls, which first appeared in 1992 in Japan, are based on an anime show in which these characters are superheroes, dressed in sailor outfits, fighting against evil villains. It seems that many fans of Sailor Moon are also fans of Jem. But are the shows really that alike? The main character has a secret identity and then there are some punk haircolors on some of the characters, two with pink hair: Sailor Mini-Moon and Wicked Lady. And one of the main characters, Sailor Mars, has red star earrings. The blue-haired doll pictured is Sailor Mercury. Soon upon their arrival these dolls became Mattel's biggest worry since the Jem dolls, infact they practically erased Barbie from the doll shelves. You could walk into toystores and had to literally search to even find a few Barbie dolls. A whole new generation of collectors ruled now, and they practically said Barbie was over. Eventually Mattel did as they usually do, released their response, a very similar line of dolls. 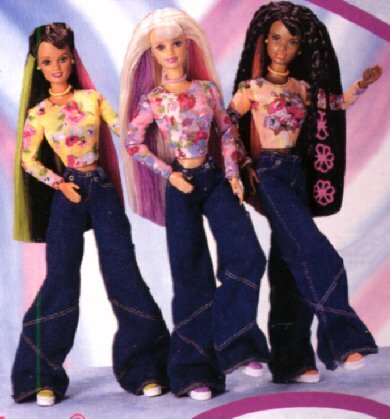 Mattel called it "My Scene", and the dolls had a lot more in common with the Bratz dolls than Barbie's regular format, with the big heads and a more modern style of clothing. This wasn't enough though. Despite contradicting themselves by having copied the style of the Bratz dolls, Mattel even took MGA to court, claiming the creator of the Bratz dolls had created the look of the Bratz dolls while he still worked at Mattel, and claimed the right for this doll format. Mattel managed to stop the Bratz dolls' takeover of the doll market for a while. And as the case went back and forward in favor of the two companies, Bratz lost a lot of ground on the market. So in retrospect Bratz who could have ruled the doll scene to this day, instead practically became known as a parenthesis, a shortlived trend in the doll industry. Similarities to the Jem dolls, are large heads and some releases with punk hair colors or rockstar themes. There's a series of rocker dolls "Girlz Rock" which came with instruments and one of the dolls had pink hairstrands. The "On the Mic" series had a music theme and came with wild hair color strands and instruments. The "Masquerade" dolls have wild hair colors like all pink hair (three dolls) and other colors, but were likely made to compete with Mattel's "Monster High" dolls. The Moxie Girlz was MGA's new line of dolls that were created during Mattel's lawsuit against the Bratz dolls. They are slightly larger than the Bratz dolls, but have a similar shape. The dolls in this set came with an instrument, a mike, and a wig of wild hair colors to change into. 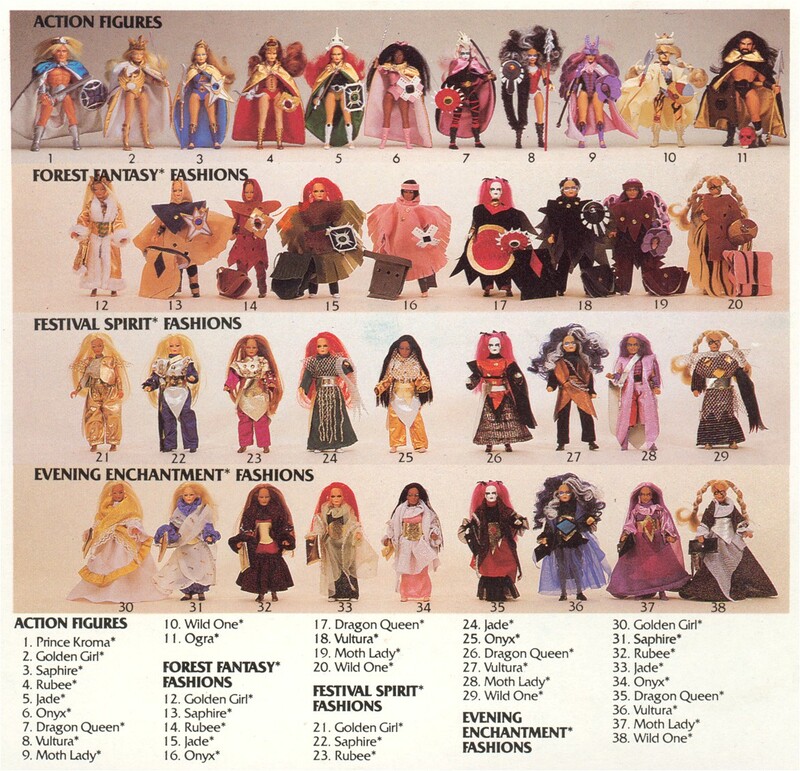 Some lower quality dolls, which weren't marketed in an organized way, but worth mentioning because of their similarities to Jem. A 11�" doll made in Hong Kong which is an obvious Jem copycat, with the artwork, the colorful hair, and even unusual set of instruments. Apparently came carded or boxed. Donna wasn't just the name of a rock and roll doll though, this company released all kinds of dolls under this name. Diana, 1997 by Kee Fung Plastic World Ltd. There were several of these released, and this particular one had a dress with a fabric from the Jem Glitter 'n Gold fashion "Fire & Ice", and they even used red fabrics under, and it was cut the same way, and came with white net tights and red shoes, and the top was of metallic fabric but not golden though.